Apparent first edition, first printing (not stated in the book). Copyrighted 2013 to Septime Verlag (afterword copyrighted 2013 to its author). Contents page is p. 5, which gives the wrong title page (56) for Schlangengleich erneuert die Erde sich. Individual copyrights, translators, original English titles and year of the original titles' first release on unnumbered p. 486f. Jürgen Schütz credited for dustcover on copyright page. Publication date from publisher's e-mail. Price valid in Austria (the home country of the publisher), price in Germany: €23.30. The prices are not printed in the book. 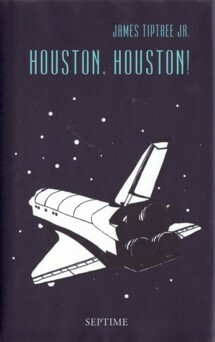 Collection Title: Houston, Houston! • collection by James Tiptree, Jr.